The group continued their summer school journey as they arrived in Penang for Phase Three of the TUT-USM Summer School program. The Summer School participants arrived in the recently established TUT-USM Technology Collaboration Centre for lunch. The TUT-USM Technology Collaboration Centre is where the students would meet for the next week. The third phase of the Summer School program began with the students reviewing and analyzing the data they collected with the Community Sustainability Assessment tool. The students listed the most problematic areas of the villages they visited to identify the needs of each community. Subsequently, the students proceeded to prioritize the needs which required the most immediate action. The students then shared their results with each other, with each pair producing a powerpoint presentation of their results. The following day, the pairs compiled a list of the varying problems that each community faces, each pair then selected a community need that they would attempt to address. The area that they selected was a combination of being a need of high priority and also a need that fitted with each pair’s background and skillset. Over the subsequent days the pairs worked on their ideas and project proposals. This is what they came up with. USM’s Rahim Kamaluddin and his TUT Naoki Kanazawa partner proposed modifying the current solar panel system which a number of the indigenous villages have access it. The pair believe the current solar panels are not being fully utilized, they proposed creating a rotatable bamboo solar panel system, by which the panel could be angled to face the sun at all times of the day to improve absorption of the sun and thus increase the solar energy available to the Orang Asal. TUT’s Tomoka Tanishita and her USM partner, Siti Noorkhairina Sowtali’s, project proposal focused on improving the ventilation and reducing the heat experienced in the modern houses located in the indigenous village of Teban Bharu. 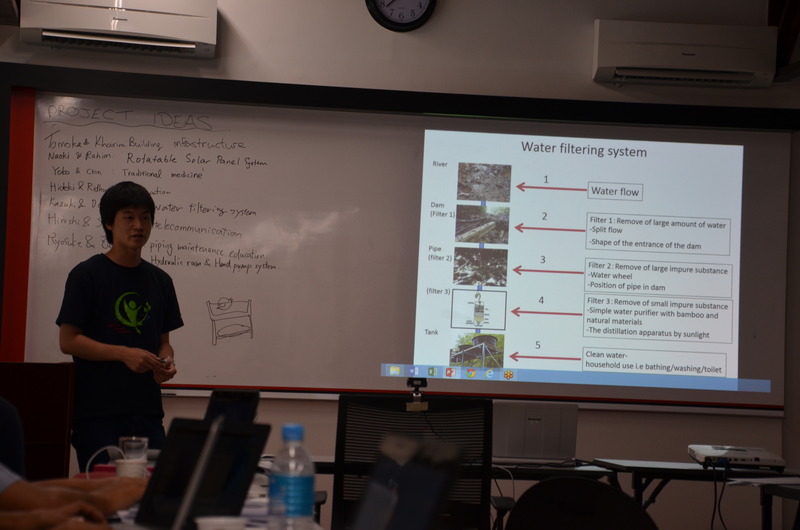 The twosome of, TUT’s Kazuki Nakamura and USM’s Damitri Qumat, proposed a sustainable bamboo water filtering system that would improve both the quality of and access to clean water for the indigenous people. They weren’t the only pair to focus on the issue of improving the access and quality of water supply to the Orang Asal. USM’s, Zulhusni Suhaimi, and his TUT partner, Ryosuke Kupi Horio, proposed introducing a water supply system which they believe is easy to maintain. Their proposal had a second component as Zulhusni wisely, and now famously, said “technology is useless without maintenance”, the pair also proposed plumbing maintenance education to empower to the Orang Asal with the knowledge to keep the water supply system functioning. TUT’s Hiroshi Seki teamed up with his USM’s Shazwan Bin Mohd Din. Their project proposal entitled “Get the Wave”, entails improving telecommunication signal and establishing a Local Area Network in the indigenous villages. The First Mile Project recently installed computers in Air Banun so this proposal might go some way towards helping BRAINetwork and the Orang Asal achieve their goal of a fully functioning cybercafé in the rainforest. Like Hiroshi, Hideki Tamura, of TUT’s Master Course of Computer Science and Engineering, also choose to direct his project towards the use of computers. Hideki and his USM partner Ridhuwan bin Che Musa, proposed creating an interactive educational app to tackle illiteracy, which they named “Rideki”. The seventh pair, USM’s Ch ing Ching Chang and TUT’s Yoko Hasegawa’s, proposal addresses the Orang Asal’s health and socio-economic status with the creation of a medicinal herb and plant farm. The students worked hard to finalize their proposals in order to present them in TUT-USM Penang on the 18th of September. Prof. Zalina Ismail and Assoc. Prof. Dr Wan Aasim Wan Adnan of USM provided feedback on the student’s proposal presentations. The following day the students gathered together to work on the Summer School’s student forum and closing ceremony, both of which would take place the following day. It was a long but enjoyable day of preparations. The 20th of September, the final day of the Summer School program, kicked off with student forum. Its purpose was to reflect on the program we had just undertaken over the past two weeks and to assess where the Summer School could go from here. Hideki, in his Baju Melayu (Malay shirt), assumed the role of MC for the forum, and he started with a brief introduction of the forum before inviting Zulhusni, the student forum moderator, to join him. Zulhusni was then joined by the other forum participants, Naoki, Sith Rini, Kupi and Rahim. Zulhusni quizzed the participants on various aspects of the Summer School program and also invited questions from those in attendance at the forum. The student forum provided some interesting insights and feedback of how the summer school was experienced by its participants, which can hopefully be used to improve the program for next year. After the forum, it was then time for the closing ceremony. 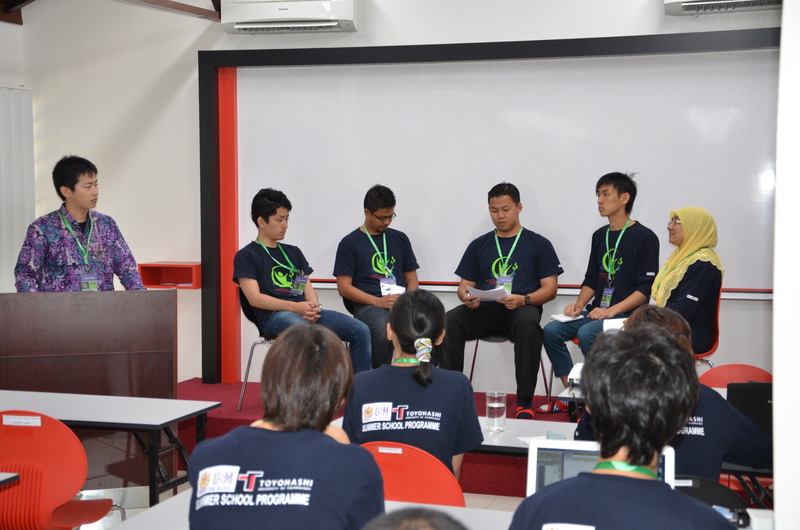 The closing ceremony of the TUT-USM Summer School 2014 was opened by co-MC’s, Sith Rini and Ryosuke Kupi Horio. They welcomed our esteemed guests, Prof. Dr. Mitsuteru Inoue, Executive Trustee, Vice President, Education Affairs at Toyohashi University of Technology and Prof Dato’ Dr. Ahmad Shukri Mustapa Kamal, Deputy Vice-Chancellor, Academic & International Affairs, Universiti Sains Malaysia. 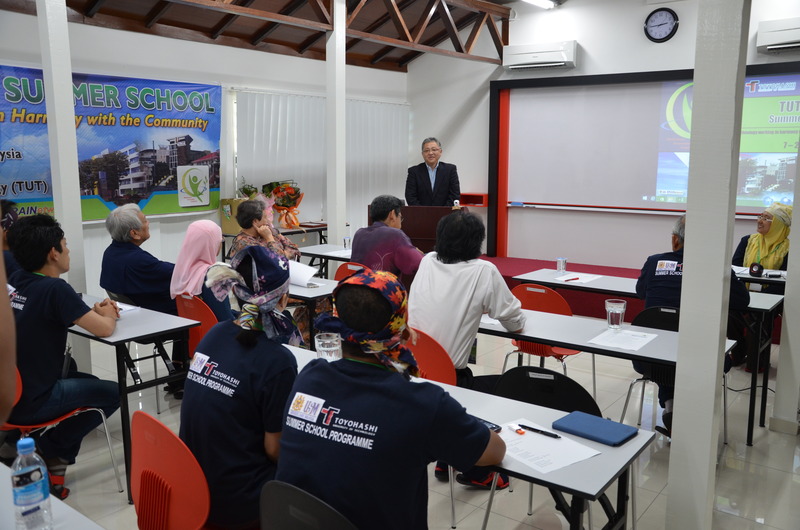 We were also joined by Prof. Nakauchi, although he was not physically present in Penang at the time, he was our online onlooker, viewing the closing ceremony via a video streaming application from his office in Toyohashi University of Technology in Japan. Next our guests learned what our summer school program was all about, courtesy of Yoko and Damitri’s presentations and speeches. Naoki then presented a multimedia production depicting the group’s Summer School journey from arriving in Kota Bharu, to their data collection in the rainforest, to their project proposals in Penang. Kupi then invited Prof Dato’ Dr. Ahmad Shukri Mustapa Kamal to provide a speech, he discussed the sustainability of the programme. According to Prof. Ahmad Shukri, USM was very pleased with the success of this first ever Summer School Programme and he was especially pleased with the various projects that were to be carried out. He wantyed to see sustaionability and a positive change take place over the next five years. 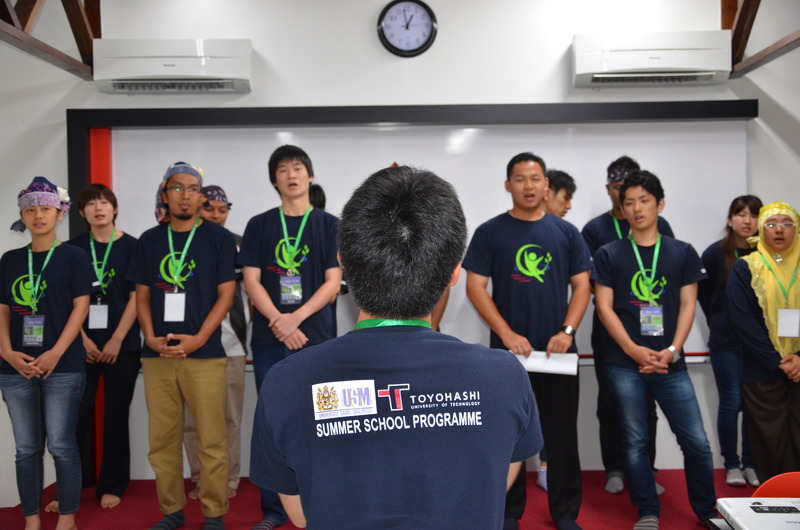 The Summer School participants then sang the Japanesse song, “ My Country Home”, in unison, before producing a Dikir Barat performance, which Zulhusni sang over with lyrics the group wrote together. The students were then presented with certificates for participating in this inaugural Summer School program before tea and snacks were served to the guests in attendance. The link below portrays Phase 3 of our School Program, from data analysis right through to the project proposal presentations and closing ceremony. It wasn’t all work and no play with the group enjoying some free time, exploring Georgetown’s famous street art, the lofty heights of Penang Hill and as well as some exercise maneuvering our way through Penang’s Escape Theme Park.